A festival of modern Indian films held in Moscow last week attracted large audiences and showcased some contemporary Bollywood cinema and fashion designs. The 2nd Indian Film Festival took place in Moscow between September 3 and 6, with the support of the Embassy of India in Russia and the Jawaharlal Nehru Cultural Centre. The main venue of the festival this year was Formula Kino Gorizont, where the audience viewed as many as six new Indian films in four days. 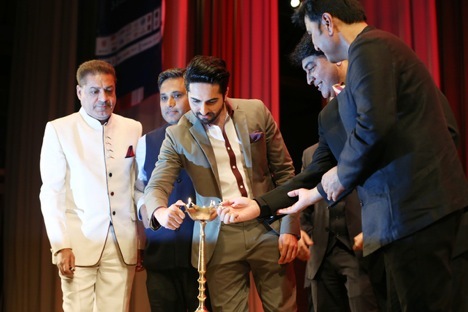 The opening ceremony at the Indian Cultural Centre was attended by the star team of Bollywood actors, directors and producers, including Madhur Bhandarkar, Raima Sen, Radhika Apte, Sheel Kumar and Ayushman Khurana. Surprisingly, for many, the special guests of the evening were the well-known Russian musicians Dima Bilan and Sati Kazanova, the friends of the festival's president Sarfaraz Azam, and, by their own admission, longtime fans of Indian culture. The show at the festival became the Russian road show of the film, before it was only shown back in India, and, among European countries, only in Ireland. Sircar brought two other of his films to the festival; the spy thriller “Madras Café” (2013) and the comedy “Vicky Donor” (2012). The modern-day remake of Shakespeare's ‘Hamlet’ called “Haider” (2014) by Vishal Bhardwaj, was the festival’s closing movie. The Asian Film Academy named “Haider” the film of the year this year, and Vishal Bhardwaj won the best director award. Part of the festival’s concurrent programme was to showcase contemporary Indian film fashion by graduates and teachers of JD Institute of Fashion Technology. After Russia, the Indian Film Festival will move on to Switzerland, Nigeria, Singapore and Azerbaijan. Read the full article at Russia&India Report. Read the full interview at Russia&India Report.